In this guide we'll go through the steps to create a really simple Command Line Interface (CLI) to your MinuteDock acccount, via the MinuteDock API. Inside Terminal.app and get a summary of your currently active time entry. This is a useful start if you want to quickly log time without leaving your Terminal, or if you want to make it quick and easy for you or your team to execute a number of complex operations. You should see a message like "1 gem installed". Congrats, you're ready to use Thor! You should get a similar "gem installed" message. We're ready to create the skeleton of our CLI. Save this as md.rb. You should get some automatic output from Thor listing the available commands. For the moment this will just be the help command that it creates for us automatically. In order to access our MinuteDock account, we'll need to provide it with our MinuteDock API Key. 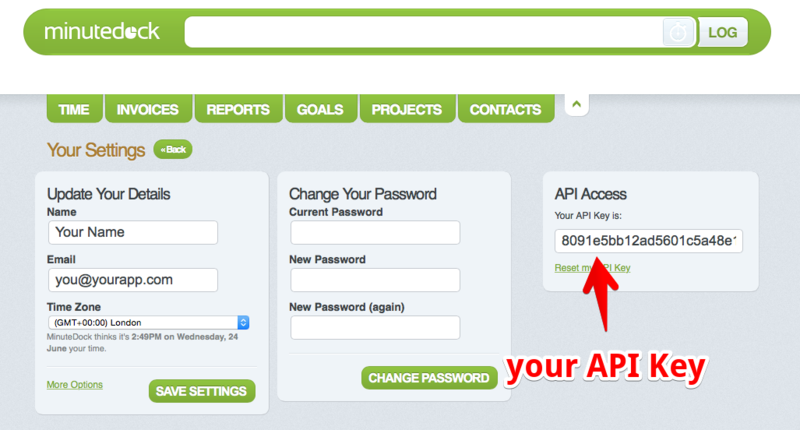 You can find your API Key on your MinuteDock Profile Page. Note: If you'd like to share your file with other people later, be sure to remove your key. You can also modify your program to read the key from a .minutedock file in the user's home directory, rather than hard-coding it in the file. desc "status", "Returns the current entry status from MinuteDock"
We've also configured HTTParty here, and told it that the MinuteDock API is at https://minutedock.com/api/v1. HTTParty provides the "get" class method, which will perform an HTTP GET reqest to the base URI plus the first parameter (in this case, the full URL will be https://minutedock.com/api/v1/current.json. We also tell HTTParty to include our API Key as a query parameter so MinuteDock can authenticate us. It should print out some JSON representing your current entry. If you get an "Access Denied" message here, double check your API Key. The first thing we'll need to do to get nicely formatted output is make another request to the Contact Resource and retrieve the name of the contact for our current entry. First we're getting the entry data out from the HTTParty response (because MinuteDock sends the response with an application/json Content Type header, HTTParty knows to parse the JSON into a Ruby Hash for us). Then we're checking if the current entry has a contact ID, and if it does, we're making another HTTP GET request to get the details for that contact. Finally, we output our message! And get a nice summary of your current timer status. Sometimes it would be nice to quickly log our current MinuteDock entry. With our Thor CLI, that's really easy to do. Just add another method to the MinuteDockCLI class that performs an HTTP POST request (using HTTParty) to the Log Entry Action. desc "log", "Logs the current entry"
puts "Okay, we've logged that!" This method is very similar to status, except this time we're checking the HTTP Response code of the POST request using .success? to ensure we've successfully logged an entry. You'll notice your current entry has been logged. We've built a basic CLI for your MinuteDock account, and you're now set up to extend it if you want - just add more methods to the MinuteDockCLI class. But you might need to change it, depending on the location of your Ruby executable (check which ruby). Your timer is currently paused for no contact.